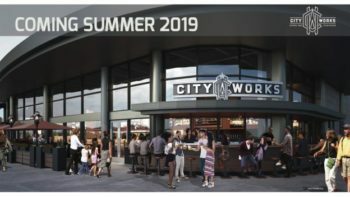 City Works Eatery & Pour House is coming to Disney Springs! In the summer of 2019, the West Side of Disney Springs will become home to this restaurant and bar featuring craft beer and American food. Guests can also expect to enjoy plenty of high-def TVs (including a 165-inch screen) showing live sporting events. In keeping the with the current seven City Works Eatery & Pour House locations, the Disney Springs location will serve 80 beers on tap. These will include rare, limited supply, special tappings from local breweries as well as from spots around the globe. Wine will also be served. No matter what you choose, expect the pub grub, shareable plates, burgers, and more to pair well with your beverage! City Works Eatery & Pour House will offer TV viewing of live sporting events. Like the other City Works Eatery & Pour House locations in the country, the Disney Springs location will serve 80 beers on tap from local breweries as well as from around the world. The 5 NEW Disney Parks Restaurants We Can’t Wait to Try in 2019! !